Color(s): black & white, white & orange, white & lemon, white & chestnut or tricolor. Speckling may be present. The English Setter is a very gentle breed of dog with an endearing character. Brought up in the correct surroundings with a good training hand and social mingling, they tend to make good companions, especially to little children. However, this breed must not be trusted with smaller and defenseless animals, having said that, they take well to other cats and dogs. They are fast learners.They respond well to humans and crave human interaction and are also known for guarding skills. This breed originates from France, way back to the 15th century, where it was developed by crossbreeding the Spanish pointer and the french pointer belonging to the setter family, which includes the Red and White Irish setters. The English Setter traces its roots back to the 15th century, thus hails from the red Irish Irish Red and White Setters, and black-and-tan Gordon Setters. It is a gun dog, bred for a mix of endurance and athleticism. This breed was to the UK, in the 18th century and here it was perfected and given its name by Sir Edward Lavack. This breed is known to be headstrong, thus an experienced handler, is a must as this breed, can be sensitive, to the sound of ones voice. This breed is known for its pointing instincts, furthermore, they make excellent hunting dogs and do best in a home, where they can have a job to do, on a regular basis. The English Setter needs daily brushing to keep the coat in a good condition. It is important to check the coat for burrs since burrs tend to get stuck in the coat. Those English Setters that, are used as show dogs, need grooming thrice a week. Dry shampooing is recommended in order to maintain the body's natural oils, thus this helps to keep the long coat in a good condition. 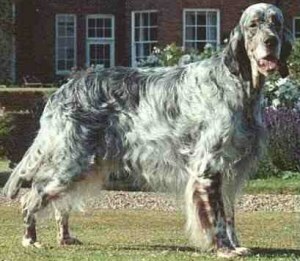 The show English Setter is generally known to have an heavier and longer coat than, the field Setter. This breed has some genetic problems which occur occasionally. Canine hip dysplasia, elbow dysplasia, congenital deafness (affecting about 12.4% of dogs in this breed), canine hypothyroidism, and autoimmune thyroiditis (affects 27.4% of specimens) are some of the better known disorders that can affect this breed. A certain type of cancer is also found in older members of the breed. Some dogs tend to have allergies, including food allergies. Life expectancy is between 10 to 12 years, however, with the correct medical attention 13 to 15 years is expected.